50 States Commemorative Coin Program Act (Pub.L. 105–124, 111 Stat. 2534), enacted December 1, 1997 authorized that the United States Mint shall mint five quarters each year beginning in 1999 to commemorate each state entry into the union. The program concluded in 2008. However, people in the District of Columbia and the five United States Territories felt left out. Therefore, additional legislation was introduced that authorized circulating commemorative coins be issued to recognize The District of Columbia, American Samoa, Puerto Rico, U.S. Virgin Islands, Guam, and Northern Mariana Islands. Each state was allowed to design their own coins. However, some prohibitions included busts of famous people, state seals, state flags, logotypes and depictions of living people. Otherwise, the governor could approve any design he/she wanted. All approved designs for the state quarters program where then submitted to the Treasurer of the United States, for final approval. Each year five coins were released into circulation approximately ten weeks apart. Official ceremonies attended by U.S. Mint officials and dignitaries were held to kick off each new coin release. Mint official distributed free samples of the new coin to children in the audience. Roles of the new coins were available for sale to those in attendance. Coin collectors and everyday people collected the 50 State Quarters, District of Columbia and U.S. Territories rolls of uncirculated quarters. The United States Mint made these coins between 1999 and 2009. The mint made hundreds of millions of the 50 State Quarters, District of Columbia and U.S. Territories quarters. These coins commemorated all fifty states, Washington, D.C., The Commonwealth of Puerto Rico, Guam, American Samoa, The U.S. Virgin Islands, and The Northern Mariana Islands. Also, the experts estimated that over 100 million people collected them. Therefore, many people saved uncirculated examples of these coins. If you want top dollar for your quarter rolls, you need to sort them and organize them so a coin dealer can quickly see what you have. Since the 50 State Quarters are still circulating in general commerce, only the uncirculated rolls carry a premium value. 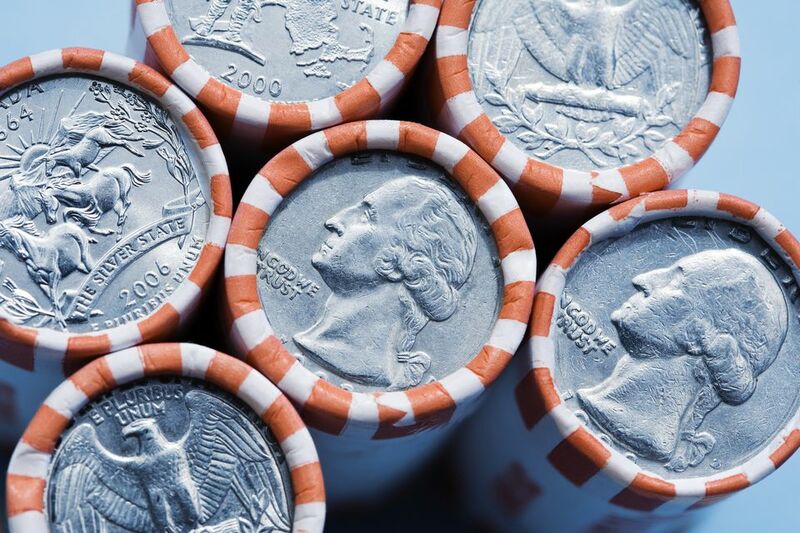 Additionally, some coin dealers are overstocked with rolls of uncirculated state quarters; they may not even offer you face value for them. However, you can still cash them in at any bank. The United States Mint produced the 50 State Quarters at three different mints: Philadelphia (P), Denver (D) and San Francisco (S). The San Francisco mint only produced Proof coins. The picture link below illustrates the location of the mint mark on the obverse side of the coin to the right of George Washington's ponytail and below the motto "In God We Trust." Listed below are coin values for coin rolls of 40 uncirculated coins with a face value of $10.00.